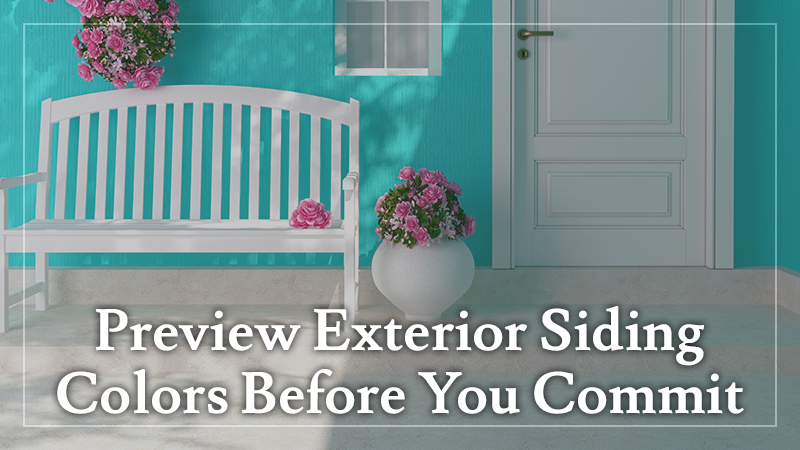 Don’t you wish you could preview your home’s exterior colors before making a final decision? We know, we do, too. That’s why James Hardie created a brand new color tool with the curated palette of ColorPlus® Technology colors in a variety of home architectural styles. Now you can see your home clad in a deep blue, rich red or stylish beige siding or trim before you commit to color that will likely clad your home for years. You can envision your dream palette on your home’s architectural style, explore the combinations of a main color and accent hues, even include in the color of the roof, windows and doors—all before the siding and trim even go up. 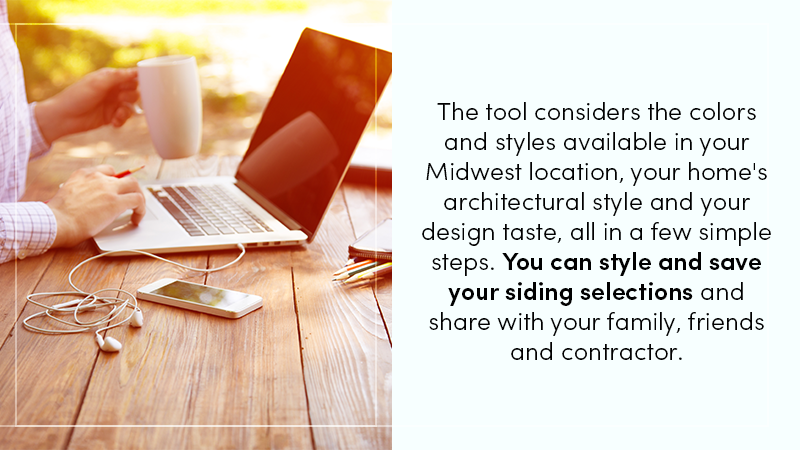 The tool considers the colors and styles available in your Midwest location, your home’s architectural style and your design taste, all in a few simple steps. You can style and save your siding selections and share with your family, friends and contractor. Here’s a breakdown of the tool’s easy-to-use steps. 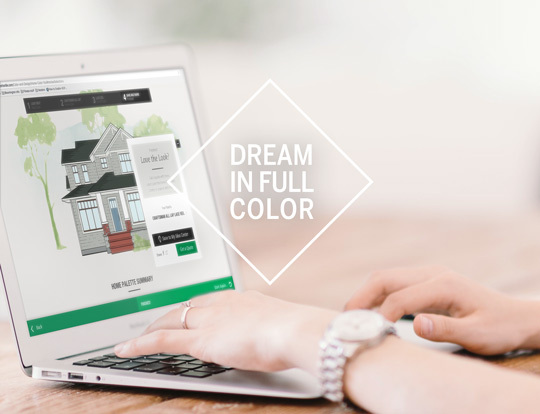 Now you can start designing and envisioning your exterior siding and trim colors sans stress. This will be the most prominent color in your color palette, so be sure it’s a hue that speaks to you and your home’s style, whether it’s an expressive Evening Blue or a subtle Sail Cloth. From Colonial to Craftsman to farmhouse, the tool offers a long list of home architectural styles, so you can find one that looks strikingly similar to your Midwestern abode. Once you select your style, you can see the main siding color with HardiePlank® lap siding, HardieShingle® siding, HardiePanel® vertical siding, or a mix of the options. Choose accent and trim colors that complement your main siding hue selection, with names like Spruced Up and First Snow; it’s actually fun to sift through the curated color combinations to find one that speaks most to you. Or if you have your own color combination in mind, custom create your own palette by using the custom palette tab. Once you’ve selected your main siding, accent and trim hues, you can also select your roof, window and door color from a wide array of color options. These final details add character and help to get a sense of the colors that complement and those that stand out in the palette you’ve selected. We’ve got to say, playing around with bright door colors gets us inspired to design with more unexpected combinations of colors. Once you’ve created the look you love, you can save it and share it. There’s also a home palette summary laid out for you, with a comprehensive list of all of the colors you’ve selected from your main siding hue to the color of your door. If you’re ready to take a closer look at starting the siding project, you can even get a quote. For an added bonus, the tool provides you with your very own color personality based on your color tool selections. It’s exciting to see how your style sense—be it more traditional or trendy—informs your color personality. The new James Hardie color tool can help you feel confident with your new exterior color palette—selecting your siding colors just became less fuss and more fun. At L & L Contractors, we are a proud provider of the James Hardie color tool. Contact us today to start designing the exterior of your home.